Hotel Nicanor | Dumaguete Hotels and Resorts | Dmgte.com - Your guide to Dumaguete, Negros Oriental, Philippines! 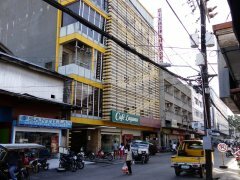 One of the best hotel choices in Dumaguete, Hotel Nicanor is a favorite among travelers to Dumaguete. Safe, clean and well furnished, this is a truly great place to stay! Be sure to check out Cafe Laguna, a great restaurant on the bottom floor. Wired internet in every room.